LOOSE WEIGHT AND KEEP IT OFF PERMANENTLY! Presso-Therapy stimulates venous return helping to eliminate toxins faster. Combined with infrared it literally melts your fat cells! Such lymphatic drainage helps reduce pain and swelling, and to slim the body. The infrared heat produces relaxation and eliminates tension in the muscles. 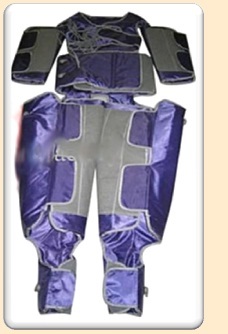 Slenderpress also relieves poor blood circulation by promoting the blood flow. And improved blood flow also improves the condition of the skin which begins to receive more nutrients and oxygen. "I feel as though I just finished a hot yoga class after my Sleder Press session! I'm so relaxed and rejuvenated." Mary N.
A Presso-Therapy session typically takes around 40 minutes. Slenderpress combines functions of Infrared Sauna, air-pressure lymphatic drainage, optional low-frequency stimulation. A soft, pain free air pressure is applied to massage the body. This air pressure massage is used to dissolve the fat cells and achieve a cellulite reduction. It also acts as a body faradic and lymphatic drainage to detoxify certain harmful deposits inside the body and the internal organs. Designed with masterful scientific precision, this massager activates the lymphatic circulation, softening and breaking down the connective fat tissue, as well as excreting any toxin and waste through the inflation and deflation cycles. This process provides an effective and long-lasting solution against cellulite, fatty deposits and fluid retention, thus becoming an ideal instrument for weight lose. The massager's pressure is equal to 100 pounds of pressure, which, when used on your belly 30 minutes for example, would equal to performing 150 proper sit-ups! The Far-Infrared slimming treatment can help increase your basil metabolic rate. (BMR) This is the fastest and most natural way to lose weight! Far-Infrared Heat Therapy effectively helps increase blood circulation without putting strain on your heart. It also increases the levels of oxygen and white blood cells in your body. Furthermore, it stimulates the production of collagen (a building block for human tissue) in your body and helps get rid of toxins by causing you to perspire. You get the benefit of a stronger immune system, better cardiovascular health, and a faster ability to heal from soft tissue injuries such as tares, pulls, and sprains. Far-Infrared heat can effectively smoothen body meridians, promote blood reconciliation, reduce inflammation, and relieve pain. Infrared thermal radiation directly acts on the adipose tissue, dissolving and liquefying fat cells. This effectively accelerates blood and lymph circulation, promotes fast metabolism, decomposes and consumes a large amount of fat cells, increases local tissue temperature, expands your pores, and allows them to perspire more--swapping the water inside of fat cells for blood, thus significantly reducing them in size. How does Presso-Therapy effect your body?